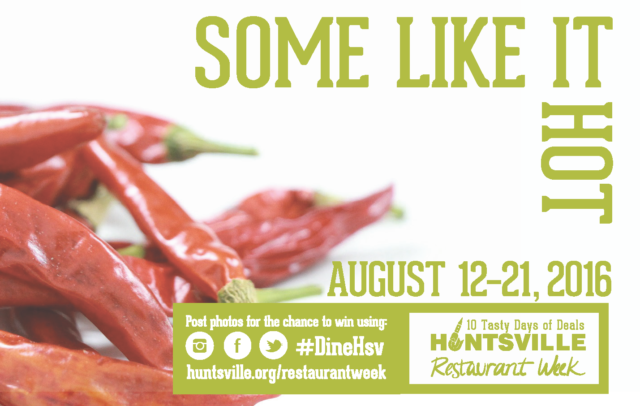 2016 Huntsville Restaurant Week - Cooking With C.C. This years restaurant week starts this Friday and runs August 12-21 (Yes, I know it’s actually 10 days – includes 2 weekends!). A wide range of Huntsville restaurants are participating in this years event. Each restaurant has a fixed price Restaurant Week menu for lunch and/or dinner depending on the restaurant. For a list of participating restaurants, see the Restaurant Week web page here. From the list, you can see the special menu items for each restaurant. This is a great chance to get out and try some new places. Be sure to enjoy this annual event.